"This is a delightfully fresh salsa with a slight kick, that is super tasty with jerk chicken, grilled seafood, quesadillas or warm corn chips (especially blue ones - the colors are fabulous together!). Plus, it is super easy to make! This salsa is fairly mild, although the onion does pack some punch. I like it this way as a contrast to more spicy Mexican or Caribbean dishes, and because it really allows the yummy fruit flavors to shine!! However, you can add some fresh jalapeno or other pepper if you want it more spicy." 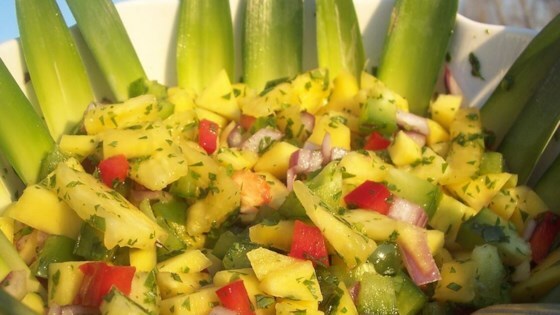 Place the pineapple, mango, cilantro, lime juice, and red onion in a food processor. Pulse until ingredients are combined and chopped to desired texture, about 4 or 5 times. This was the worst tasting salsa I have ever had. I was so disappointed, what a waste of a perfectly good pineapple and mango! The combination of flavors was terrible and it smelled awful. I made this and got great compliments from family and friends. I did add a small amount of jalapeno. Delish!!! i did not like this recipe...to much cilantro,bad combo of ingredients. I couldn't find any good ripe mango so I used chopped gala apples instead-yum!